"It's a wonderful day!" 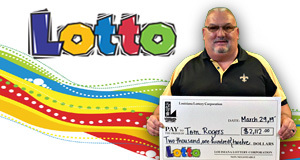 Winner Tom Rogers remarked during his trip to Lottery headquarters on March 29. The winner - who is a Kentucky resident, currently residing near New Orleans for work - stopped by the Baton Rouge location to claim his $2,112 Lotto prize on his way back home! Tom purchased his winning ticket at Pit Stop Petroleum #2 in Luling. He was excited to tell his family about the big win and says his new cash will be spent "however my wife wants." Congratulations!